The string length is 400mm (a regular full-size guitar is 650mm) and the body size is ca. 365mm. In order to accommodate the neck and position the bridge in the center of the lower bout of the guitar the 10th fret is aligned with the edge of the upper bout. This is quite unusual because standard-size guitars have either the 12th or the 14th fret aligned with the body. The result is a very short neck and a very compact small guitar. 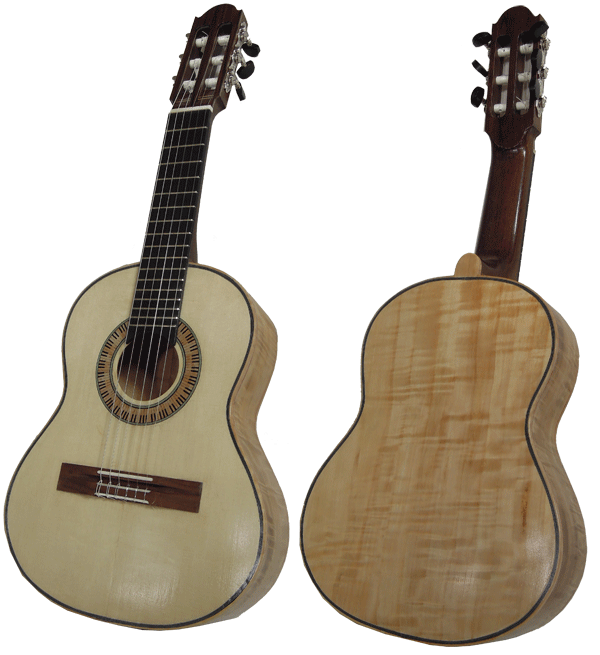 While the Octave Guitar is almost unknown in the United States it has some popularity in South America and Europe. It is often used as an ensemble instrument because of its bright and penetrating sound that makes is audible in an ensemble over the other instruments. I built this guitar for a friend who is a choir singer and uses it to learn his notes.